As seen in the mod “Rise of Kings: Chronicles” for Rise of Nations! 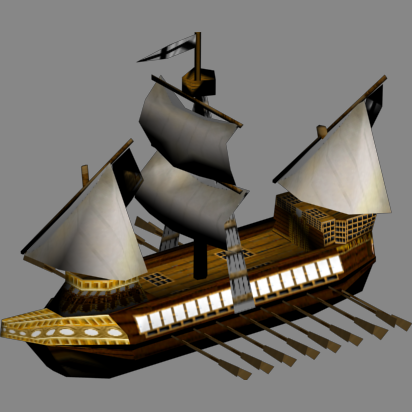 A hybrid of a fully-rigged ship and a galley, the galleass is an attempt to combining the movement and construction speed and cost of a galley with the line of sight, firepower, range, armour and rate of fire of a carrack, by having side guns as opposed to bow-mounted guns. 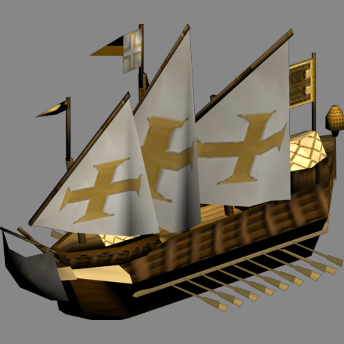 Although slow and unwieldly thanks to its size, it did not stop other nations such as Spain, England and even the Ottomans from adopting galleasses in their fleets (in Turkey, a galleass was known as a mavna): the early Tudor navy had around a dozen galleasses which were meant to complement the great ships or carracks of the fleet. Eventually, the Galleass lost its oars and adopted a more extensive sailplan, evolving into the galleon and the frigate, the latter owing its name to the “fregata” or pocket galleass, a smaller version of the Galleass that attempted to reconcile the dilemma between having large hulls (Galleasses) and mobility (smaller galleys) in the Mediterranean. V 1.0a Single double square rig, with fore and aft lateens. Poly count: 504 faces, 842 polys. V 1.0b Triple lateen masts, with square rig foresail with canopied focsle and poop. Poly count: 552 faces, 925 polys. Animation type: dummy, with attack animations calibrated for 48 ticks in RoN. Oars and sails are rigged and can be manipulated. Unmarked white sails, extensive filligrée finish. Christian markings, with crosses emblazoned on sails.